For full details of my Stryker Brigade Combat Team project can be found here, with details on 5Core Company Command. I am starting up again, here is a short solo game I played this weekend. One innovation is I created some sliding firing calculators printed with the basic 5 Core Company Command rules. Here are some pictures, you can find them at the link above under Play Aids. Feel free you copy them and modify to your heart's delight. Click to enlarge, you will also notice I have also incorporated some of my own idiosyncratic rules changes. 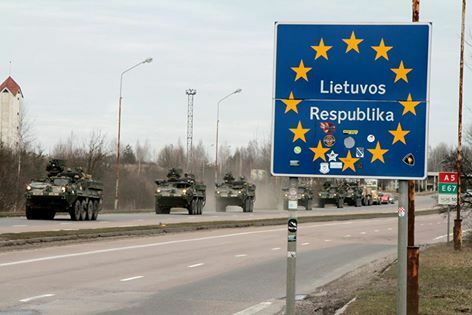 2nd Stryker Cavalry Brigade Combat Team (BCT) has deployed to defend The Republic of Ruritania from aggression by Krasnovian backed separatists and Krasnovian regular forces. The BCT's overall mission is to restore the territorial integrity of Ruritania and expel Krasnovian forces. 2nd Squadron has been tasked with advancing to contact and establishing blocking positions to delay the advance to Krasnovian Battalion Tactical Groups (BTG's) while the rest of the Brigade deploys. E Troop is the lead element of the Squadron and squadron scouts have identified a platoon sized blocking position of Ruritanian Separatist Militia along Axis of Advance CUSTER. You are the platoon leader for 2nd platoon and have been ordered to perform a hasty attack to clear this force and allow the rest of the Squadron to move forward unimpeded. 1 x Infantry Squad in treeline on other side of road. Here you can see the initial scheme of maneuver for the platoon. 3rd Squad and Weapons Squad with 2 x M-240 MG's would set up a position on the wooded hilltop to support by fire 1st and 2nd squads. When the enemy position is suppressed, 1st and 2nd squads will use their mobility to out flank the position and destroy it by close assault. At least that was the plan. In the picture you can see the militia have moved to re-position their AGS-30 to cover the new threat. 3rd Squad and Weapons squad dismounted in order to provide suppressive fire, but accurate fire from the militia infantry squads prevent the weapons squad from setting up it's machine guns and a burst of machine gun fire renders 3rd squad combat ineffective (the squad leader, one fire team leader, and a SAW gunner were hit and required MEDIVAC. The squad would not function effectively for the rest of the battle. After this the platoon leader decides to leverage the mobility advantage of his Strykers and shift his maneuver element to the other flank, assault the isolated enemy infantry squad, and then roll up the enemy's right flank. 2nd Platoon begins to win fire superiority. The Maneiver element on the left flank manages to scatter the isolated militia squad with accurate fire from the ICV's .50 cal's. From the rest of the platoon, weapons squad manages to get it's two M240 Machine Guns into the fight and along with the other two ICV's suppress the enemy elements on the hill. Intense fire from the hill eliminates another militia squad, while the rest of the enemy elements are forced to stay hunkered down due to the volume of fire they are receiving. Meanwhile, the maneuver element roll to the rear of the enemy position, dismounts both rifle squads and eliminates or captures the remaining enemy personnel on the objective. Afterwards, it is time ti call in a MEDIVAC for the wounded and send the EPW's to the rear for processing. 3rd Squad will need to be reorganized. While 2nd platoon reforms, refuels, and rearms, the rest of 2nd Squadron passes through on the way to making contact with the Krasnovian BTG. Split the platoon into two sections, establish a base of fire on the hill to suppress the enemy on the objective, assault on the right (enemy's left) and roll them up. Accurate enemy fire slowed the development of a base of fire, and even led to taking 3rd squad out of the fight. This dislocated the scheme of maneuver. As a result, the platoon leader made good use of his superior mobility and communications system to change the axis of attack on the fly. The entire platoon could have been engaged in providing suppression fire, with the maneuver element then breaking off once suppression had been achieved. The platoon leader's initiative in changing the plan on the fly was crucial to the success of this operation along with leveraging the superior mobility of the platoon compared to the enemy. Use of Raven UAV system to reconnoiter the objective before the attack was able to confirm the lack of heavt ATGM's on the enemy's part, giving the platoon the freedom to maneuver mounted while in contact. What do you think about the platoon leader's initial plan and execution? What would the outcome have been if there had been ATGM's in the position? We may get to find out soon and 2nd Squadron continues to move towards contact with the BTG proper, stay tuned. A quick update, I am planning on getting back to the Stryker Brigade Combat team games with 5Core Company Command. This tactical vignette show the planning and execution of a Russian BTG attacking and American Stryker Battalion from the Russian point fo view. Interesting reading and would make for a good scenario. Pay attention to the thinking and use of COA's (course of action's) in the planning and execution, would be a useful approach for any wargamer in any period. This article deals with some of the strengths and weaknesses of a Russian BTG and how an ABCT (Armored Brigade Combat Team) can minimize those strengths and exploit those weaknesses. Very informative. While I try to get my table cleared off to do a small SBCT Rifle Platoon hasty attack, I have update my static web page of modern resources. I have added a new folder for scenarios I am scraping from the web, mostly professional education Tactical Decision Exercises and a complete list of all the resources I have used. Now back to clearing the table, until then, good gaming! Multiple non-aggression pacts between the Gangsters and British Colonial Troops, that conveniently expired on the British payer's turn! Doc Savage's inability to punch out a cultist for 3 turns in a row! ... until Doc Savage quickly builds a magnetic resonator to seize the eye from her! A close run game, Doc Savage barely made it off the table, but the aircraft he was in was shot down! We'll play the scenario next year. Thanks to everyone who participated, you were awesome! Doctor Fu Manchu's party was attacked by cannibals, but several immediately joined up with him under the influence of his hypnotic powers. Tom prepares to use his feminine wiles again to seduce more unsuspecting cannibals and nazis. Doc savage seizes the Mcguffin, err I mean Eye of Azathoth using the power of SCIENCE!!!! I traveled to Raleigh, NC last weekend for Southern Front put on by the Triangle Simulation Society. I must say it was a blast, I had the opportunity to meet many fellow gamers and the best part was just sitting around shooting the breeze about military history with like minded fellows. In particular, I got to meet and talk rules with John of John's Wargaming page. It was a pleasure! I encourage anyone who can to attend next year, it is a small but cozy convention, I think they had about 70 participants and all of the people were friendly and the games looked great. And it was much quieter than Historicon. Here are the files I used for the scenario, please feel free to use them. I will be putting up a Pulp specific page on my website, but this will give you access until then. I am going to post my recap of the event in parts, mostly because I am still trying to recover, I stayed up way past my bedtime. I arrived late Friday night and immediately crashed after stacking up my stuff for my game. I arose at 7, had a nice breakfast, and set up my table to be ready at 9. But, I had no players! I was set up in one of the side rooms and did not get a lot of foot traffic. No worries, though, I was actually glad. I needed the time to regroup from driving 5 hours the night before to get there after work. So, I wandered about and took a few pictures, will share them in a future post. Meanwhile, here is what my setup looked like. The Bugsy and Bunny Gang arrive, seeing revenge on Alexander Crawley, who double crossed them and stole the heiress they kidnapped fair and square! Doc Savage and crew are intent on saving the world. Miss Shirley Uoff struggles at her bonds, hoping to avoid a fate worse than death! The player playing the Germans was actually German, so the accent was spot on! Miss Lemon saving the world with a precise shot that shatters the EYE OF AZATHOTH, preventing who knows what evil from fully materializing into our world. The RCMP, Hercules Poirot, and the heiress taking off in the seaplane, only to have it blow up in a magnificent ball of fire after the Germans shoot it with a flare gun! In the end we voted and the Gangsters won, as they achieved their objective of murdering Crawley in revenge, with the artifact destroyed and the girl toast, everyone else was pretty much out of luck. The game took right at 2 hours, so met my speed requirements. Also, I asked for and got great feedback from the players on the scenario, specifically, some factions that had no fire arms needed to start closer in! I did that for game 2, and I actually think for the next time i run this, I will go with a 4 x 4 table to get everyone in the action a little quicker. All in all though, everyone seemed to have fun, which is the important part! Here are some shots from the first game, next time, a recap of game 2! Here are my erstwhile players, you never met a finer bunch of near'do wells and lovable rouges. The RCMP immediately after the dino attack. Being Canadian, I am sure there will be a LOT of paperwork for this one. Fu Manchu and company struggle with Cannibals while the gangsters close in. The colonial authorities can be seen at top, they are busy exchanging shots with slavers. An unspeakable horror began to materialize, but fortunately, Miss Lemon put an end to that nonsense!